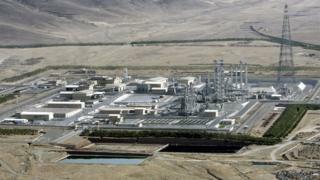 The US is buying 32 tonnes of heavy water, which is used in some nuclear reactors, from Iran. The US State Department said the $8.6m (£6m) purchase was designed to help Iran meet its obligations under the nuclear deal signed last year. Officials said the heavy water, which can also be used to produce weapons-grade plutonium, would be resold for research purposes. The move has already attracted criticism from US Republicans. Paul Ryan, the speaker of the House of Representatives, said it was "another unprecedented concession to the world's leading state-sponsor of terrorism". Will Iran get a McDonald's? The heavy water will initially be stored at the Oak Ridge National Laboratory in Tennessee before being resold. Under the nuclear deal, Iran is allowed to use heavy water in its modified Arak nuclear reactor, but must sell any excess supply of both heavy water and enriched uranium on the international market. In a statement, the US Energy Department said the US would not automatically buy Iranian heavy water in the future, saying it was Iran's responsibility to find a way to meet its commitments. Meanwhile, US Secretary of State John Kerry was due to meet Iranian Foreign Minister Javad Zarif to discuss Iranian concerns that sanctions relief promised under the deal has not materialised. The US has ruled out giving Iran access to the US financial system or direct access to dollars.